"My better half could not eat potatoes for a year (it's a long story), and used to make her own potato chips (crisps) from other sources, such as sweet potatoes and beets. The secret to this recipe is to slice the vegetables ultra thin. I use a mandolin or the slicing blade on my food processor. This makes a unique appetizer for a Super Bowl party!" Carefully fry beet, sweet potato, turnip, parsnip, and golden beet slices in the hot oil, working in batches, until golden brown, 2 to 4 minutes. Remove vegetable chips with a slotted spoon and transfer to paper towels to drain. Allow to dry and cool. Season chips with sea salt, cracked black pepper, and malt vinegar to taste. Combine yogurt, parsley, mint, garlic, and green onions together in a bowl. Stir lemon juice, salt, and white pepper into yogurt mixture to your taste preference. Learn how to make this simple, creamy artichoke dip. 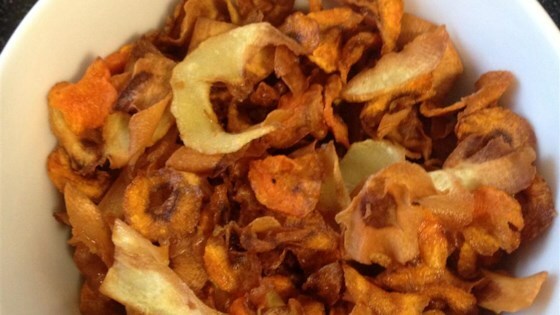 I want to thank you for posting a root vegetable chip recipe. I have been looking for one. You made my day!!! P.S. These are fantastic.